We all love home decor that screams creativity! Several of you have seen the adorable hats on page 38 of Annual Inspirations and have asked for instructions on how to recreate them. Below you’ll find step-by-step directions you can use with the Annual Inspirations recipes already provided to give your home a little more spook this season. To find a list of the other materials required, please refer to the Annual Inspirations recipes. 1. Attach two sheets of 12″ x 12″ B&T paper on top of two sheets of 12″ x 12″ cardstock. This double-sheet thickness is needed for extra stability in the cone of the hat. 2. Using tape, attach the two sheets of layered 12″ x 12″ papers together to form a 24″ length. Ensure that edges are precisely aligned. 3. 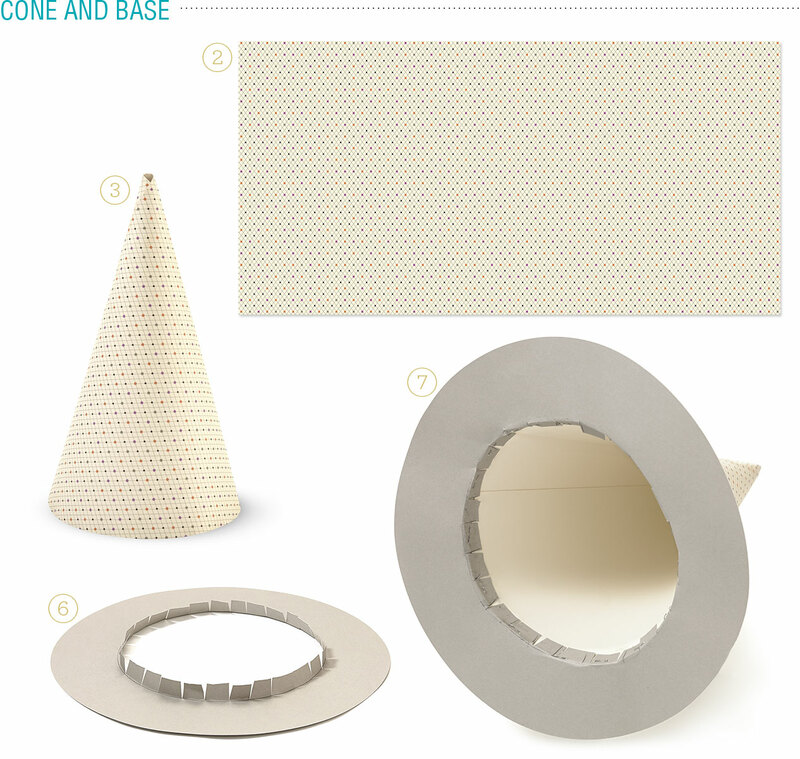 Starting from one corner, roll the paper into a cone, adjusting to form your desired shape. Use a strong adhesive to hold it in place. Hats will measure differently according to how tight you roll your cone. 4. Cut the 11″ circle to form the base of the hat. 5. Center the cone on the base and trace the bottom of cone onto circle shape. Trace another circle within the first, about a 1/2″ smaller than the original. 6. Trim out innermost center circle, then use scissors to cut ½” slits approximately 1″ apart around the entire outer circle to create tabs. Fold tabs upward. 7. Staple, or adhere with a strong adhesive, the tabs into the cone, starting from where you would like the front of your hat to be. 1. Cut out spiderweb cupcake liners and trim off the tabs. 2. Attach four of the 2 ½” spiderweb liners underneath the base of circle so that the edges of the webs extend beyond the rim of the hat. 3. Attach the 2″ spiderweb liners along the top of the hat’s brim against the inner edges, near the cone. 1. Select where you would like the front of your hat to be and adhere the 2″ banner to it. 2. Adhere 1 ¼” banners overlapping the larger banner around the bottom of the cone. 3. Cut several ½” strips of B&T paper, pleat them, and attach them end to end on the bottom of the cone. 4. 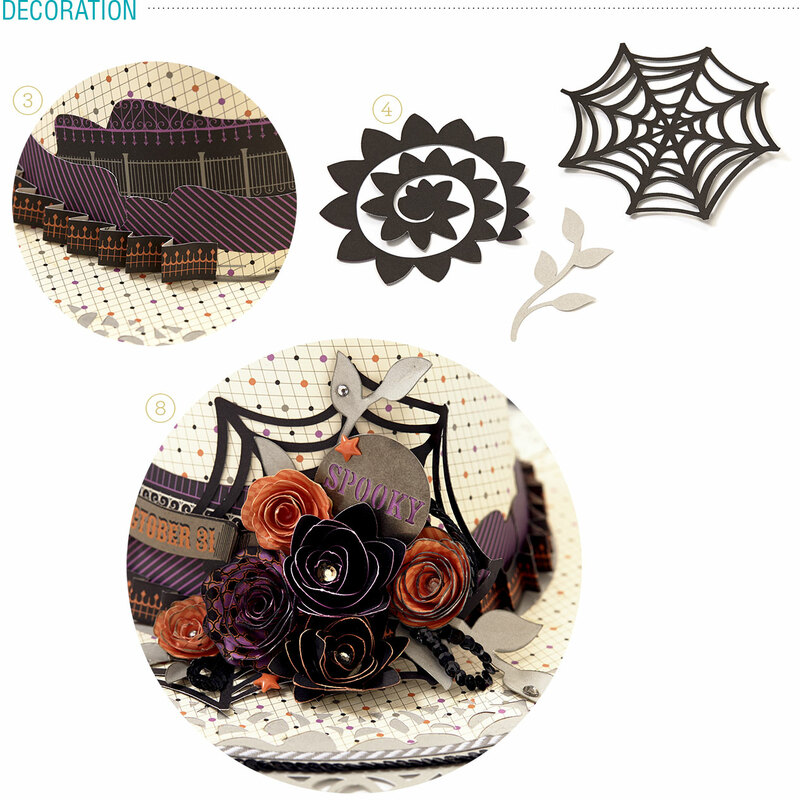 Cut out flowers, spiderweb, and vines from the Cricut® Artiste cartridge. 5. Use an embossing tool to mold the leaves of the branch shapes. Ink the edges with Slate ink using the sponge dauber. 6. Ink the edges of the flowers in Thistle and Sunset using the sponge dauber. Using your quilling tool, roll the flowers, adhere them closed, and add Sparkles to the center of each as desired. 7. Attach the spiderweb to the side of the cone and layer the floral arrangement on top of it. 8. Back the “Spooky” metal shape from your Scaredy Cat Complements with Thistle cardstock and add it to the floral arrangement. 1. Cut a 2″ x 12″ strip of Thistle cardstock. Cut a 1″ notch every ¼”. 2. Using your quilling tool, roll the strip until the solid edge is small enough to fit into the hole at the top of the cone. Adhere it so it cannot unroll. Make sure the roll is small enough to fit into the top of the cone. If needed, trim the tip of the hat to allow more space for the topper. 3. Fit the curled hat topper into the hole at the top of the hat and secure with adhesive. 4. Using your quilling tool, roll the ¼” strips downward into tight curls. 5. 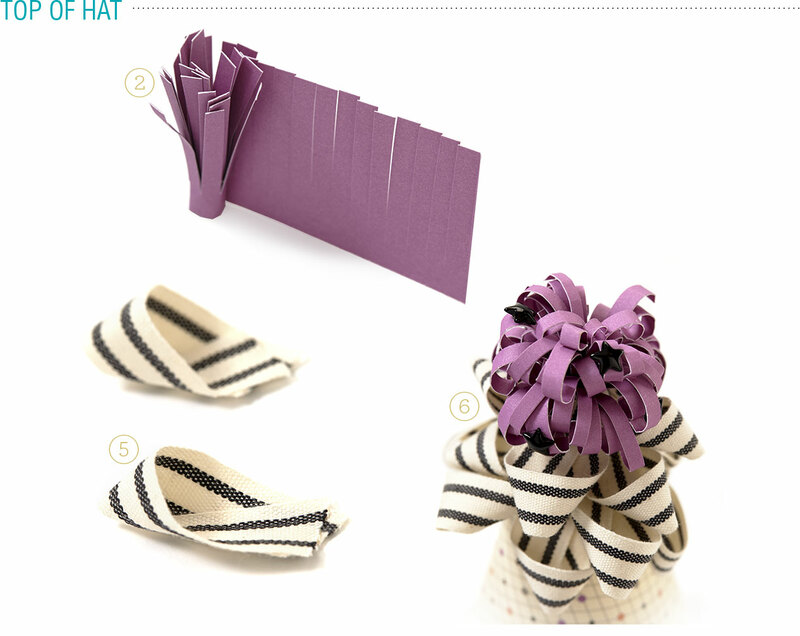 Cut the ribbon into 3″ pieces, loop them, and adhere them individually to the top of the hat, arranging them in layers. 6. Add stars from the Scaredy Cat Assortment. 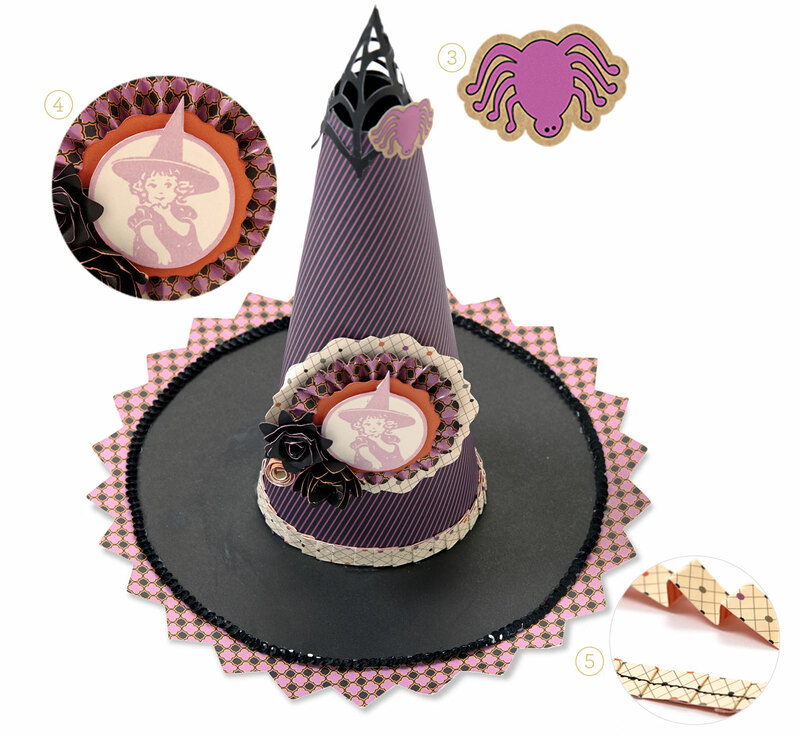 Embellish your hat with the Scaredy Cat Assortment, sequins from the Mini-Medley Accents black collection, Slate diagonal striped ribbon, or other accents of your choice. 1. This hat’s base is made from a sunburst shape from the Cricut® Artiste cartridge. 2. 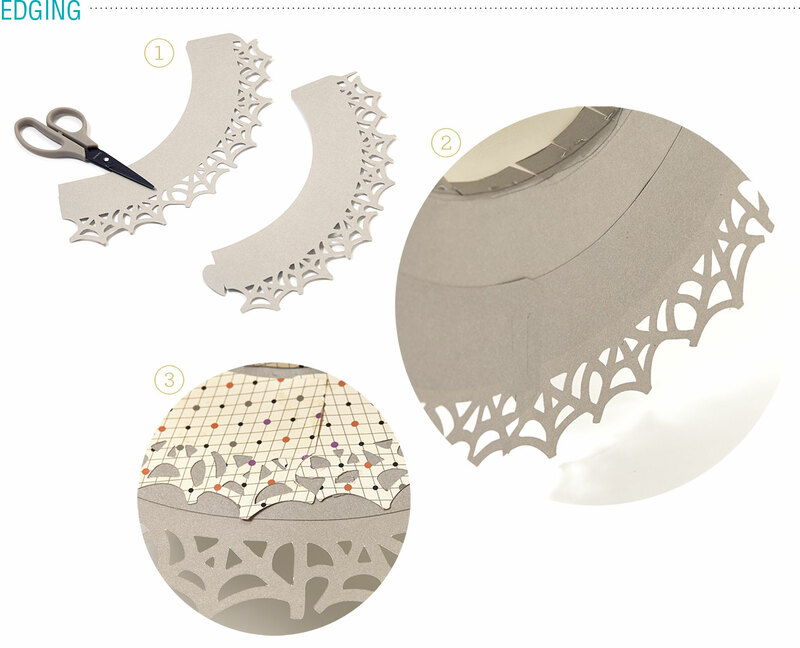 The spiderweb topper is made from two webs cut from the Cricut® Artbooking cartridge. Adhere their edges together and trim hat as necessary. 3. The spider image is from the Scaredy Cat Complements. 4. 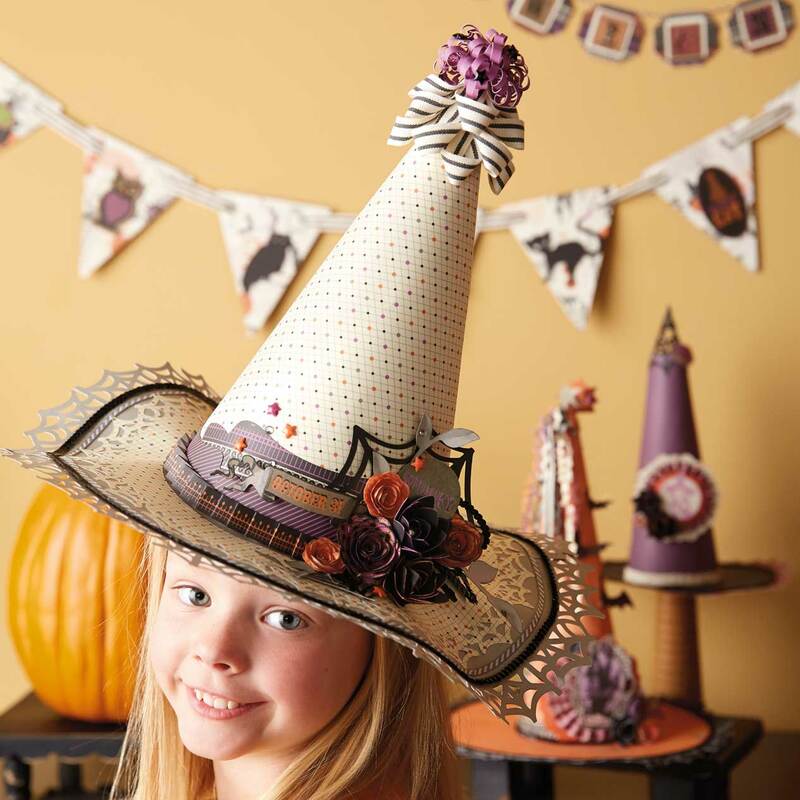 The focal point of this hat is made from a stamped image from the Halloween Greetings stamp set. 5. The pleated strip of B&T at the base of the cone was stitched before being adhered to the cone. 1. The streamers dangling from this hat are made from a variety of Scaredy Cat B&T papers that have been folded accordion-style and attached at the top. 2. This hat’s focal point is an image cut from a sheet of Scaredy Cat B&T. The bat images are Scaredy Cat Complements. 3. There you have it. I hope you enjoy your haunting home decor additions! We would love to see how your hats turn out! Feel free to share a photo in the comments or on the Close To My Heart Facebook page. Page Not Found. Please check the URL. The link on FB worked. Cute hats. This is awesome! One of my customers asked me recently how to make the hats. I am so glad we don’t have to figure it all out ourselves. Thank you so much for posting this. I can not wait to make one. The hats are so beautiful! Thanks for posting the instructions! 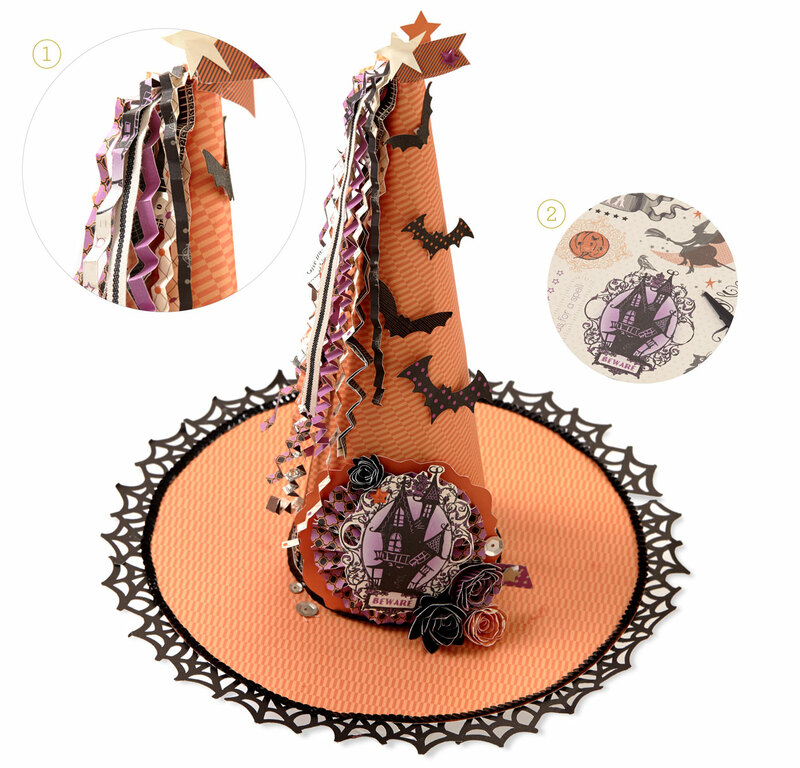 Anyone interested in getting together to make these witches’ hats as table centerpieces for Halloween? I’ve got all the materials…. just contact me and let me know you are interested and what day/time works best for you. Happy haunting!